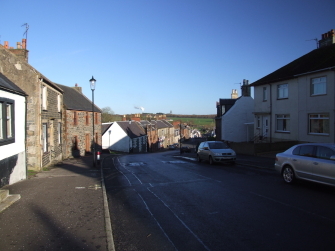 The village of Ochiltree is located to the west of Cumnock, Ayrshire. It is the centre of a large parish. There are no Covenanter graves in the parish, but there are a number of associations with the Covenanters. David Dun - martyr, buried in Old Cumnock. He belonged to Closs farm (no longer extant) in the parish. Pentland Rising - the Covenanters camped overnight during the march from Ayr to Rullion Green. The Ochiltree Covenanter flag is held by the National Museum of Scotland in Edinburgh.